When you’ve finally decided it’s over, it’s never easy. But if you stay in an unhealthy relationship, it doesn’t get any better it only gets worse. And it can drag on and on… and the longer you stay, the more complicated it is to get out. So is there an easy way? The topic for the month of November is "Getting Over a Breaking Up". Breaking up is never easy, and that’s why it’s easier to deny that there’s a problem. It’s simpler to keep the status quo than make a change. You justify that “no relationship is perfect” and “it’s really not that bad”. And if you’ve been thinking this, you may be right. Leaving a relationship is no easy decision and should not be taken lightly. But it's often necessary. Many couples stay in a bad relationship or have affairs and feel guilty, and they’ve known from the start that their relationship was wrong in the first place. They stayed because they thought it would be harder to get out. Wishful thinking! If the same issues keep coming up and nothing has changed before, why now. 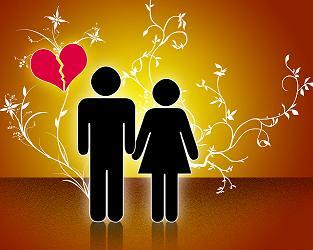 If you’re continually hurt, betrayed etc then breaking up may be the only way to go. But if you’re simply upset, talk it over and resolve it. If you’re so emotional and can’t discuss things properly, don’t avoid it. Write things down and talk when you’re calmer. Repetitve problems may be helped through counseling. Words like ‘we should talk’, ‘we should spend less time together’, or’ let’s take a break’. - should be said after plenty of consideration. Never, never say them in the heat of the moment. Discuss your feelings calmly with your partner. Explain your decision, and why you’ve finally decided the relationship must end. You’ll get all kinds of emotions. When someone’s feelings are hurt, they’re hurt. And no matter what you say or do, there will be negative reactions – you’ve hurt them and they may want to get you back. This is the difficult part of the process and it’s better to be prepared. He/she may not understand, so you’ll get questions. Why? When did you decide this? Do you have someone else? How can you do this to me? Don’t avoid the questions, answer them. This is someone whom you’ve loved and who is hurt. They’re entitled to an explanation – no matter what it is. When you’re hurt, you’re hurt. Tears should be expected and when someone’s hurting they should be comforted. Comfort the other person but remember, no matter how many tears someone sheds, there’s no reason to turn back. Once you’ve made your decision, don’t be manipulated. Stay strong. “I’ll change”. “ Everything will be different, just come back”. “Give me one last chance”. This pleading and bargaining makes you feel guilty and it’s an attempt at getting the relationship back. If you’ve discussed the same problems in the past and things have not changed, there will be a short ‘honeymoon’ in the beginning, but don’t expect any long-term changes. Anger is normal. It’s a way of keeping self esteem. However, use your intuition. When you hear “You’ll regret this”, “You’ll be sorry for what you’ve done to me” and similar threats. Use your intuition. If you feel physically threatened, don’t ignore it. Take precautions. 6)	Remind yourself of the cruel or mean things that your ex did or said to you. This will motivate you forward. 7)	Take time to reflect on the situation and don’t jump into another relationship to make him/her jealous. Breaking up is a loss and very painful. Give yourself time to heal and re-create a new life. Use this time to improve. Do the things that you’ve always wanted to do, but haven’t been doing when you were a couple. Co-dependency’s the topic of next month’s newsletter, because I've gotten many e-mails on the topic. Co-dependency is a very complex issue. If you have a particular question or opinion on the subject, let me know. At last!! Recovery Coaching, Personal Coaching and Consultation has officially been launched. Now you can purchase 1 or more hours and use the time in smaller increments – 15,, 30 minutes etc.– until your time is used up - and pay with your credit card. This new service has already been very well received. Thanks to Lori for all your hard work and to my husband Jerry who kept nagging me to get this going.